I’m not sure if we’ve seen this one around these parts. I for one haven’t shown many of Solido’s 1/64 line up. Just the Karmann Ghia and the W12 Nardò. Teutonic Tuesday: Ein kleiner, schöner Typ. Aus Frankreich. And we all know what impact both the Golf and the GTI made in the world of Automotive. To many it is the first Hot Hatch although there are some that dispute this claim. Autobianchi’s A112 Abarth was way ahead of it for instance, 4 years. Smaller, less powerful but such a hoot to drive I can tell you. But of course the Golf GTI made the Hot Hatch more mainstream. Power to the People. And mobilizing people was what formed VW in the first place of course. So Solido makes an excellent 1/64 Beetle as well as you can tell. Those wheels are epic. Maybe nice for some 356 Outlaw project Philipilihp? Or are they to small? There probably couldn’t be more diffences between those two cars for the masses. They do have the same amount of doors, although some count the hatch of the Golf as a 3rd door of course. I really love these Solidos, I can’t really get why we don’t see ‘m a bit more often. The Golf has one flaw, the rear axle seems to be a bit bend, look at it lifting it’s rear “leg” (a little!) like a nasty dog claiming it’s territory. Badges, wheels (okay: the centeres should be black), all seems to be accurate. Even the double lower racing stripe on the sides. 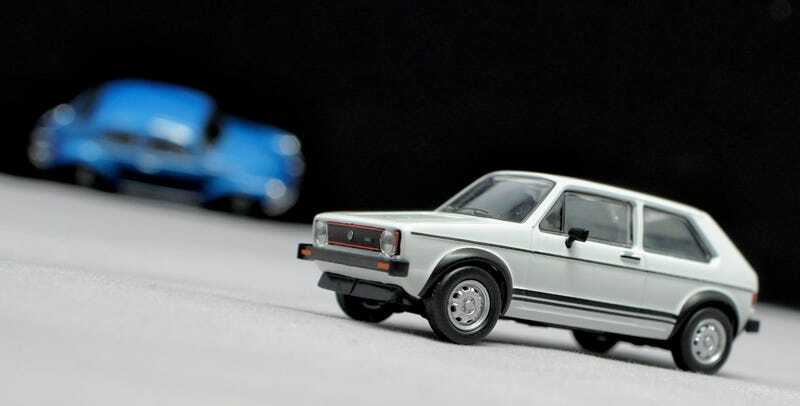 And no wonder Solido didn’t make a Golf II GTI as by then the Golf was overshadowed by some French car. But that one I’ve shown a bit too often on French Fridays probably. I’d have a hard time turning down a Golf I GTI but if the alternative would have been the 205 GTI it’s a no brainer. French Friday: Un autre retour du lionet. Avec Tricolore maintenant. And that’s it for this week. Let’s see if we’ll spot some more German hatchbacks today.